Summit the 13,800 feet tall peak of Mt. Patalsu near Manali to get some of the most awe-inspiring views of the mountains. Perched at the top, you'll be able to see the distinct peaks of Hanuman Tibba and Friendship peak rising high amidst a crowd of snow-laden mountains. Your route to the top takes you through a dense forest of pine trees, often painted white after a fresh snowfall. 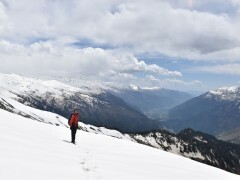 Camping in open meadows and climbing over rough inclines, you'll find yourself taking in wonderful views of the entire Solang Valley from vantage points on the trail. The Patalsu peak trek involves trekking over steep inclines for more than 4-5 hrs every day. This moderate intensity trek is perfect for someone with prior trekking experience looking for a challenge. Mt. 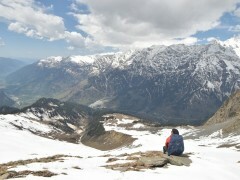 Patalsu is a tall peak located a short distance away from Manali. The summit is accessible via a trail that begins from the popular tourist destination of Solang Valley. The trail meanders through open grasslands and thick jungles, with challenging sections that require climbing over steep inclines with careful footwork. Compared to the several other mountain peaks in Himachal Pradesh, Mt. Patalsu is a relatively low altitude peak at 13,800 feet but still manages to impress with panoramic views from the summit. • Sign up to summit a 13,800 feet peak on the Patalsu peak trek. • Climb on a moderately difficult trail to reach the top. • Trek through snow-laden meadows and forests. • Get incredible views of nearby peaks from Patalsu top. Travellers are required to follow instructions of the trek leader during the Patalsu peak trek. 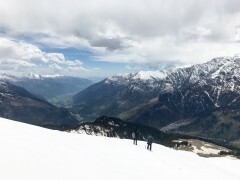 Consumption of alcohol, drugs and tobacco products like cigarettes is strictly prohibited during the Patalsu peak trek. 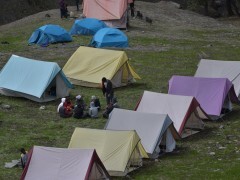 For cancellations made more than 20 days before departure date of the Patalsu peak trek: 80% refund. 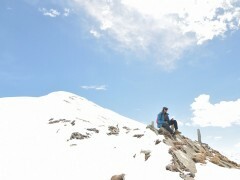 For cancellations made 20 days or less before departure date of the Patalsu peak trek: no refund. The tour operator reserves the right to alter or cancel the itinerary of this Patalsu peak trek for the safety of travellers and staff. Unforeseen circumstances such as unpredictable weather conditions may result in a forced change in itinerary. Any costs arising due to such unforeseen circumstances are borne by the traveller. The tour operator takes utmost care to ensure safety of the travellers and shall not be held responsible for any accident or mishap during this Patalsu peak trek. A private vehicle will take you from Rumsu to Solang Valley. Your trek to Patalsu peak begin as you cross the Beas River in Solang and begin ascending on foot. Through dense forests of pine and oak, you'll climb over moderately difficult inclines with artistic views of the valley in sight. Soon, the forest gives way to a large and open meadow, your campsite for the night. Overnight in tents at Shagadugh. Scenic snow-laden mountains from the Shagadugh campsite. Today, you'll leave your rucksacks behind and carry only a small daypack on your day trek to Patalsu peak. The climb is fairly tough, with difficult sections and steep inclines over craggy mountain edges and large boulders. Your efforts will be rewarded when you summit the Patalsu peak and get breathtaking views of the Friendship peak and Hanuman Tibba rising amidst the crowd of snow-laden peaks. Take in the view and descend back to your campsite. Overnight in tents at Shagadugh. Get awe-inspiring views from the Patalsu peak. 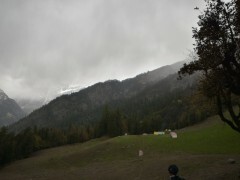 Begin descending from the mountain and retrace your steps to Solang Valley. Climbing back down, while considerably easier, still presents interesting challenges at tricky spots on the trail. From Solang, you'll be driven to Manali in a private jeep. Your Patalsu peak trek ends here. Climb over trails meandering across thick forests. Overnight in tents at Shagadugh. Drive from Rumsu to Solang and trek from Solang to Shagadugh. You'll be accommodated in tents at Shagadugh. You'll be given a sleeping bag for a restful night's sleep on all days. The high-quality tents and sleeping bags are made to withstand -10 degree temperatures. Today's meal package includes breakfast, lunch and dinner. Go on a day trek to Patalsu peak from Shagadugh. You'll be accommodated in tents at Shagadugh. The campsite will be equipped with common kitchen/dining tent to serve and prepare meals as well as dry-pit style washroom tents. Today's meal package includes breakfast, lunch and dinner. 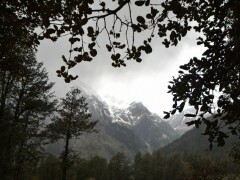 Trek from Shagadugh to Solang and drive from Solang to Manali. Today's meal package includes breakfast only. The tour operator will arrange your transport to the start point of the Patalsu peak trek.